Story and Photos by Jacqueline Harmon Butler. Somewhere in the distance a church bell chimed the midnight hour. A heavy mist made visibility along the valley road challenging. Nearing our rendezvous site we spotted two small nondescript Italian cars hovering by the side of the road. The drivers flashed their lights at our mini-bus then, with a squeal of tires, sped off along the twisting country road. 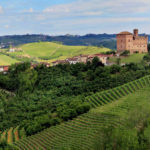 Our driver, not intimidated by their speed, followed closely behind as we bumped our way into the hills near Alba in the Piedmont region of northern Italy. We were on a midnight truffle hunt in search of the legendary “White Diamonds,” tartufo bianco, or white truffles. At a market price of nearly $2,000 a pound, truffle hunters are willing to secretly go to amazing extremes to find and retrieve these incredible tubers. Tuesday was the last day of Carnevale – and my last chance to wear one of the getups that were now all bunched up on the bottom of my suitcase. I looked at them with dismay. I couldn’t imagine venturing out in anything so light-weight and there was certainly no way I could layer enough clothing underneath one of my costumes to keep warm. I finally admitted that I would freeze to death in my thin little ensembles. So, attired in almost everything else I brought, I headed for the Piazza San Marco. 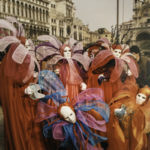 My Venetian friends had invited me to come to Venice for Carnevale. They said I could use the studio apartment kept for family and friends. This was an offer I couldn’t refuse so I arranged my schedule to be in Venice the last week of Carnevale. Then, as an added treat, stop off in Paris for the weekend before heading home. Mount Etna, Italy. 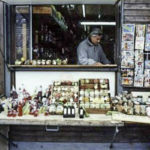 As I stood pondering the wares of the Antico Souvenir, near the summit of Mount Etna, a hand suddenly appeared in front of me, offering a small piece of bread smeared with a greenish-colored concoction. I looked up into the smiling face of the proprietor of the shop. “Signora, piacere,” he indicated for me to taste. I sniffed at the bread. It smelled heavenly. Then I slid my tongue over the paste. It tasted delicious. Happily, I popped the entire piece of bread into my mouth and smiled in appreciation. My last memory of Venice was as a 21 year old, running to catch a train with a backpack the size of my body molded to my spine. Too young, and too inexperienced a traveler, the magic spell Venice casts over first time arrivals completely washed over me. 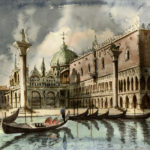 Now, decades later, I have returned to Venice, a seasoned traveler, a much older woman traveling alone with eyes and senses wide open, and as I enter the island on the Alilaguna boat from the airport, the immensity and expansiveness of Venice far surpass the impressions an eye or film can capture. The domes and cupolas asserting their architectural puissance, the palette of terra cotta and sunset colored palaces are a testament to the heart and soul that define Venice. 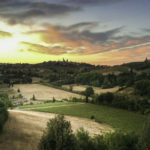 When Frances Mayes’ book, Under the Tuscan Sun, became an overnight success, traveling to Tuscany became De rigueur. But with an aversion to following crowds, I circumvented Italy in my travels. Then a year ago, I would wake up in sweat dreaming about Italy; I dabbled in Italian, and listened to opera. Eventually, I bought a ticket to Italy fully aware I was not going to have a Frances Mayes experience-no Italian lover whisking me off for a brief tryst, nor a perfect villa with a view of paradise. Yet, as Italy beckoned like a languid lover, I sensed the land, or perhaps the people would offer something I hadn’t yet experienced in my travels. Tuscany did not disappoint.